Cadena Family Dentistry is committed to helping each of our patients achieve the healthiest and most attractive smile possible. As we settle into 2015, we are sure that many of you are working hard on the resolutions that you made. Many of you made resolutions about your weight, overall health, financial security and more. How many of you made resolutions regarding your oral health? It’s OK. We understand. For most people, oral health is something that you just don’t think about as something you resolve to improve – at least not until something goes wrong. Unfortunately, when that happens it can be time consuming, costly and painful, but good dental health doesn’t have to be. What if I told you that a few simple changes to your daily routine could help you have a healthier smile? Change your Chew: If you are not a gum chewer, you might want to start chewing a piece or two every now and then. Gum chewing helps to keep your mouth moist, dislodge stuck bits of food and keep bacterial count down. It has even been shown to help prevent cracking of the teeth and gums. Interestingly, though, the kind of gum you chew matters. Sugared gums can encourage oral bacteria to flare, which can cause tooth decay and bad breath. Switch to a gum made with Xylitol. This sweetener is one that most oral bacteria can’t break down, thusly reducing your chances of cavities, halitosis etc but still encouraging the benefits of gum chewing. Change your Chew, Part Two: While we’re on the subject of things you chew, if you’re a candy eater – switch from gummies to hard candies. Gummy candies tend to stick between teeth and around the gum line, accelerating decay in those areas. If you’re an ice chewer, start phasing yourself out of that habit. Harder ice can cut the inside of your mouth and crack your teeth, which leaves you more susceptible to infection. If breaking your ice chewing habit entirely isn’t possible right away, stick to nibbling on small pieces of finely crushed ice or ice chips. You may also want to see your doctor for testing. The desire to chew ice has often been associated with iron deficiency type anemia. Finally, when eating crisp foods like certain kinds of apples, slice it, don’t bite into it. 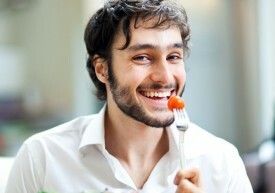 We see patients often who injure their gums biting into crispy firm foods. As they bite, the food scrapes and tugs at the gums, sometimes causing bleeding and separation from the tooth. Substitute your Soft Drinks: Sugary sodas are terrible for your teeth, the sugar coats the tooth and creates an acid as your oral bacteria breaks it down. Think about the things you enjoy about soda. For many of you, a sparkling water with a squeeze of fresh fruit would be just as effective. Citrus fruits like lemon, lime and orange can be added to give a bit of sweetness to your water. You can even add fresh berries to sparkling water to create a sort of virgin sangria. This healthy alternative will keep your smile healthier by eliminating a chunk of sugar. As an added bonus, it also cuts a good amount of calories! If you’re going to drink something other than water (coffee, wine, tea etc.) make sure to order – AND DRINK – a glass of water with each one. This will help to wash residue off of your teeth and gums. This will help to prevent tooth decay, bad breath and even keep staining at a minimum.